Think about the first time you picked up and carried a baby. It must have been an exciting but also frightening experience. You are not that sure if you are handling the baby right. 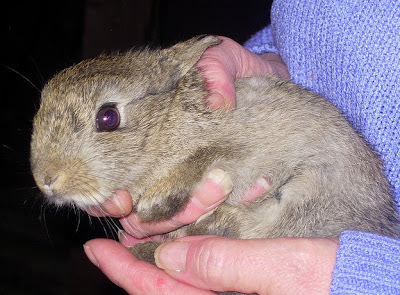 While it may offend some to compare a rabbit with a baby, rabbit handling should also be done correctly for your pet's safety and for yours, as well. The approach is the first step of rabbit handling. Do you know that your pet rabbit cannot see what is directly in front of its nose? That said, if you stroke its nose, you may get your hand bitten by a badly frightened rabbit. So, you stroke its head, instead. It is sort of like a signal that you are a friend and that you meant it no harm. Because lifting it suddenly may alarm the poor rabbit, you should lift it while crouching low on the floor. This way, your pet can see just who it is that is about to pick it up. Assure your pet that you are not about to eat it, just about to lift and cuddle it. One rule of rabbit handling is establishing the trust. The rabbit is an herbivore. It has to fend off many a predator higher up in the food chain. When rabbit handling, remember to keep your pet's back curved. Why is that so important? Well, if your pet suddenly kicks and trashes while it straightens its back, it can actually break its spine. The rabbit is not just soft and cuddly but it is also extremely fragile. It should actually have a "handle with care" sign on it. If your pet rabbit keeps fighting you off, you should slowly release it. Get down on a crouching position as you have first picked it up, and gently place the rabbit on the ground. If you do not let go of the pet and let it violently kick while being held, it could break its spine. The rabbit may also break its back if it suddenly jumps from a great height. As mentioned earlier, you have with you a very delicate pet. Upon reading the above guidelines, you now know that rabbit handling entails being extra careful. If you do not want the rabbit to end up crippled, you have to know just how to gently approach, lift, carry and release it.